One of the main projects currently being worked on at OIL is the retro-conversion project. 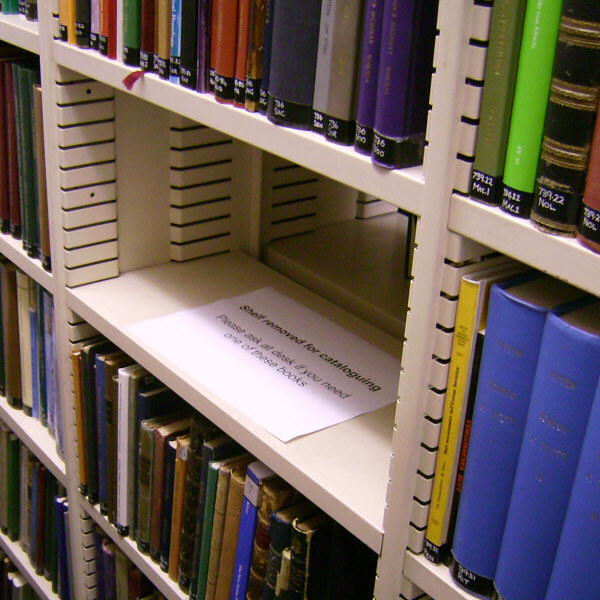 Since 1987, all books entering the library have been electronically catalogued and put into the main Oxford University catalogue- which can be searched online at the SOLO webpage. However, our older books haven’t all been catalogued electronically. Some have, but most are only searchable using the card catalogue in the library. This obviously isn’t ideal- in a perfect world, all of the books would be searchable online! The retro-conversion project aims to do just that. At Easter OIL was joined by a new Senior Library Assistant, James Fishwick, a cataloguer who previously worked for the National Trust. His main job is to conduct the retro-conversion project, and thus open up knowledge of our collection. He’s now finished most of the work on the so-called ‘Minor Collections’. Downstairs at OIL we hold collections of Syriac, Armenian, Georgian and Ethiopic/Ge’ez that have few rivals in the UK- and now they’re (almost) all catalogued and can be searched for via SOLO. The Minor Collections consist of just under 3,000 items. 1,300 of these were already on our online catalogue before James started. 1,000 had copies at other Oxford libraries, so James just had to add holdings for OIL. 400 were not in any other Oxford libraries, so had to have new records made for them or copied from WorldCat. Finally, 173 items in the vernacular have not yet been catalogued, as they’ll require a specialist. There are 3 Ethiopic/Ge’ez, 37 Syriac, 2 Georgian, 127 Armenian, and 4 difficult Russian ones. We think we’ve sorted out cataloguing the Russian items, but if anyone can help James with the other languages he’d be delighted to hear from you- please e-mail james.fishwick at bodley.ox.ac.uk! This entry was posted in Minor Collections, Retro-conversion, South Asian Collection on 4 September 2009 by .